The Skinny: You can watch and occasionally enjoy this forgettable New Year comedy. Then you'll most likely forget that you even watched it. by Kozo: This well-produced New Year’s Comedy from Clifton Ko and Raymond To is occasionally funny and silly. Yet it seems to go nowhere, which is odd since it doesn’t really deviate from the tried-and-true formula. The plot is basic Lunar New Year boilerplate: a lot of hijinks happen and couples are born of various pairings. Two mischievous brothers come to town (Raymond Wong, Michael Chow) and discover that the residents are so goody-goody that it sickens the stomach. They attempt to corrupt the locals with various results. 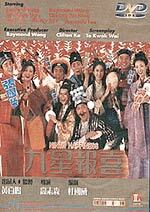 Meanwhile, Gigi Lai and Kenny Bee are deep in love, but have their relationship mucked with by a mysterious stranger (Leslie Cheung), who just happens to be the third brother after Raymond and Michael. However, Lai's sister Wu Chien-Lien (who’s still incredibly winning even in crap) really digs Cheung and he digs her. Furthermore, their family maid (Amanda Lee) wants after Raymond Wong (why?) and Cheung Tat-Ming appears to suddenly lust after Gigi Lai.